Did KC’s Economy Stall in 2011? The Bureau of Economic Analysis (BEA) recently released its estimates for metro Gross Domestic Product (GDP). The information is for 2011, so it is somewhat dated, but it is still eye-opening for KC economy watchers, and not in a good way. According to the BEA, Kansas City’s economy stalled in 2011. Technically, it declined by .007 percent between 2010 and 2011. Now, we know that 2011 was not a good year for either the local or national economy; so, taken on its own, this stagnant GDP is not too much of a concern. But the fact that Kansas City was one of only four large metros (population of 1 million or more) that didn’t see real economic growth in 2011 is a bit alarming. Birmingham, New Orleans and Virginia Beach were the other three. What should we make of this? It is easy to write off one year as an anomaly. When compared to other nearby large metros, Kansas City had been running even with Minneapolis-St. Paul up until 2011, although we were well off the national pace. We’ll have to wait and see if 2012 data shows improvement. 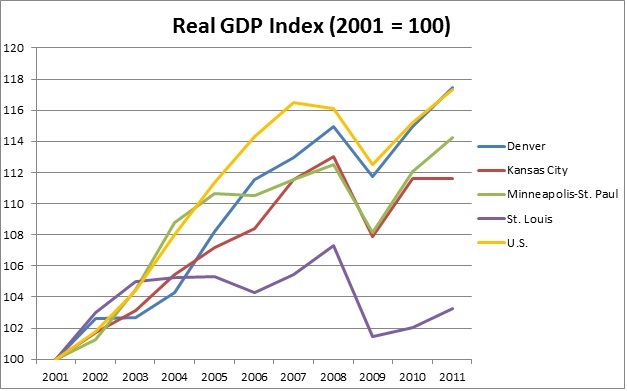 The BEA offers some insight into the makeup of the GDP by industry. The industry that stands out is construction. While construction grew slightly nationwide between 2010 and 2011, in the Kansas City area it contracted by 6 percent. We can’t attribute the overall decline in regional GDP to just one industry, but the drop in local construction certainly contributed. And as we have said before on this blog, we have reason to believe that the local construction sector started to gain traction in 2012. Metro GDP is a key economic indicator and one that we follow closely. Unfortunately, the data is only released annually and typically more than a year after the fact. But, the rate of growth in GDP is perhaps our best measure of the Kansas City region’s economic competitiveness. Future GDP numbers will tell us if we are getting back on track or falling off the pace.